This was a cruise of many firsts for us: first time on a Radiance-Class ship (and what a great name for this class, too! ); first time on a cruise that was 8 nights (our longest cruise to date! ); first cruise out of Fort Lauderdale (a really cool port- not to mention a crowded one! ); first time on the top deck (albeit in a smaller balcony cabin)! This was a thoroughly enjoyable cruise from beginning to end! We began this luxurious vacation by flying down to Ft. Lauderdale the day before the cruise (as usual) and found Ft. Lauderdale in the midst of a rainy/cloudy but warm day. 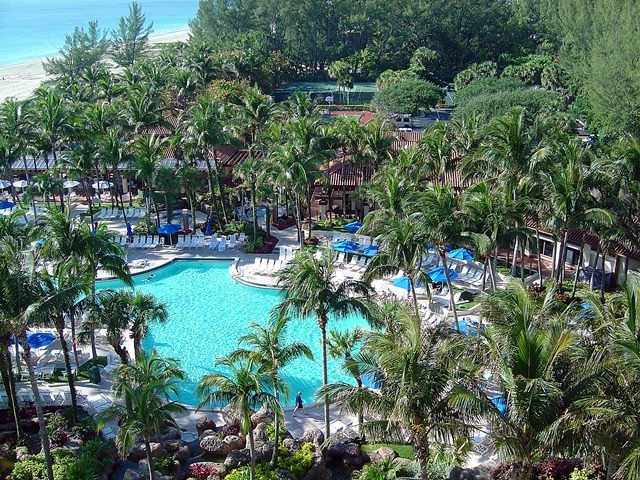 We stayed at the luxurious Marriott Harbor Beach hotel. The pool area there is magnificent! On Saturday the 9th, the day was gorgeous. We got over to port around 11:30am and we were aboard Jewel within 15 minutes. Our stateroom wasn't available for another hour, so we met up with our excellent cruise pals (and close friends) Steve and Kim (who arrived early that morning) and we ate lunch in the Windjammer then we explored this incredibly beautiful ship! We eventually caught up with the rest of our traveling group: Dad, Pat and Mac while heading to our cabins. Kim and Steve and Pat and Mac and Diane and I were in three adjacent cabins on deck 10 (1514, 1512, 1510) while Dad was in another balcony cabin on deck 7. Speaking of Dad's cabin, the only real negative about this ship was the enormous view-obstruction that runs along deck 7's balcony cabins! Dad's location had most of the balcony view blocked by a ridiculous curving wall from the deck below that made looking straight down to the sea virtually impossible. If this is important to you ( and why wouldn't it be?) contact your travel agent to change your location when sailing on this ship or any Radiance class vessel. If your location is on deck 9 or 10, your increased height will probably make this less of an issue. To completely avoid this get a cabin in the same area that we did or go for the center of the "bump out"- all of these views should avoid the overhang from below! Never have I seen a ship of such beauty and grace and warmth as this one! Sure, the Voyager class has the ultra cool Royal Promenade, and it's hard to let go of this once you experience it, but Jewel's sheer beauty made up for this. 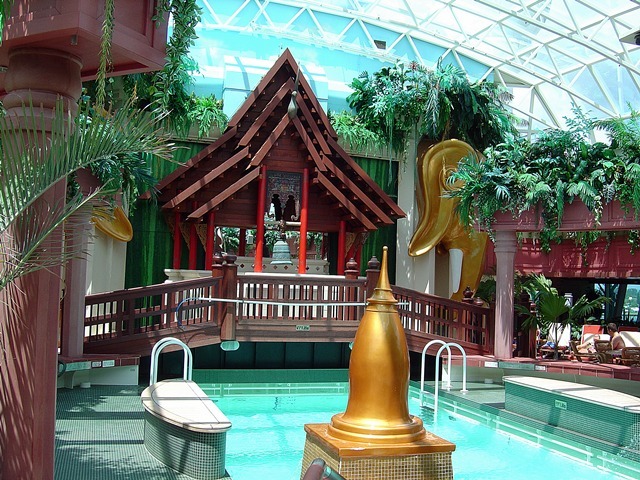 Her Solarium is Thai themed, and completely enclosed against the elements. You hear artificial bird chirping sounds by day and artificial cricket sounds by night. The Solarium also serves late night snacks featuring pizza and crepes and sandwiches! 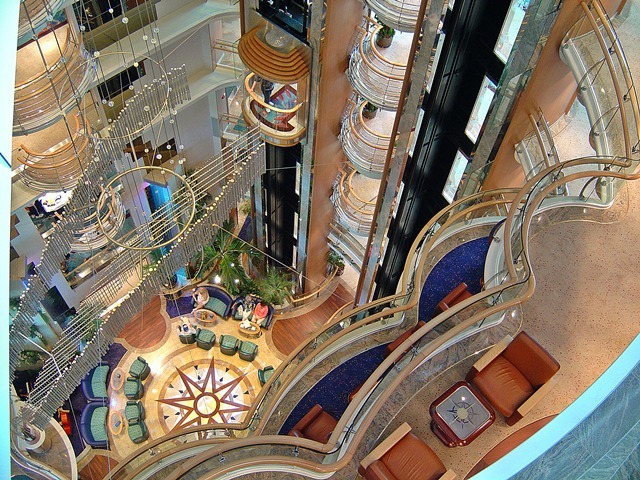 It is probably everyone's favorite spot on board. Jewel's Solarium... Adults only tranquility! The pool deck is very spacious and quite comfortable. The Centrum is simply beautiful from every angle. 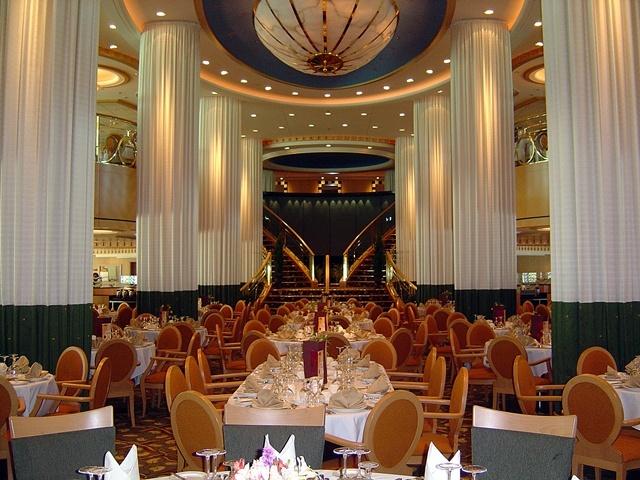 It's the Radiance class version of the Royal Promenade, and it serves as the jump off point to all of the ship's hotspots. The Vortex, an incredible disco at the top of the ship in the Viking Crown Lounge, is an excellent party spot. Yes, the entire circular bar is spinning... it's not that you're drunk! The music here was excellent except for the constant chatter of the DJ! Looking down the Centrum from the top deck! 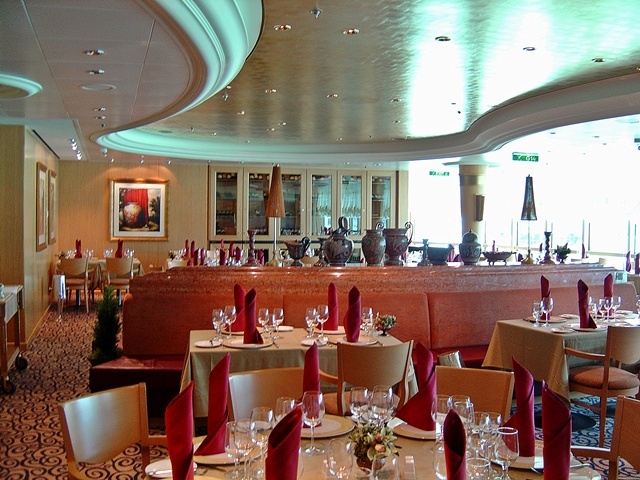 The onboard Portofino's and Chops Grille were the finest in beauty and food and service that I've experienced yet. The shows in the main showroom were terrific! The night with Marty Allen (of Hollywood Squares fame) and his talented wife was a lot of fun! He still knows how to deliver the one liners and at 85 he's still very energetic (I ran into him in the gym where he did an impressive workout on the treadmill). The production shows were out of this world GREAT! All four singers and the dancers made all that hard work look so easy and the shows were excellent. 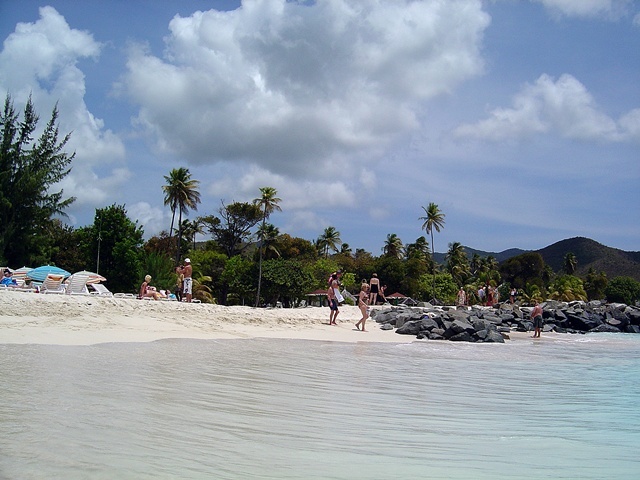 On Antigua (pronounced "ahn-tee-gah", not "ann-tig-wah"), Diane and I spent the day on an equally gorgeous beach at Jolly Harbor (although there were very few beach umbrellas, so take one of those small ones with you if you can) where we were provided with a BBQ lunch. Living the good life on a beach with a BBQ on Antigua! At St. Thomas, we had all signed up for a trip to Virgin Gorda to do the Baths, but this was canceled due to lack of interest! (Geez, what a bunch of dull co-passengers!) 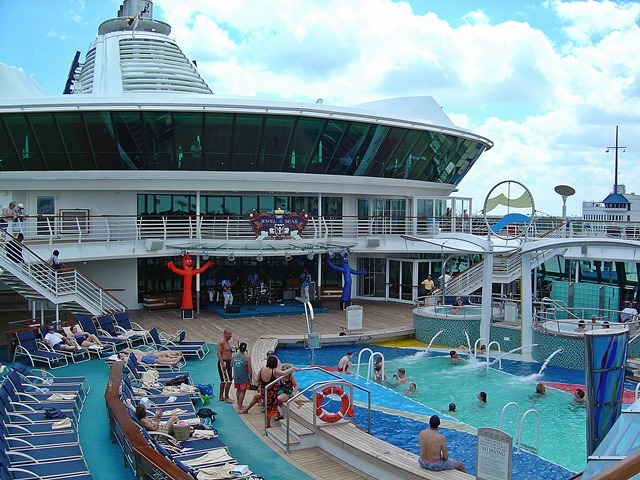 Update 2009: We finally got to do the Baths on our Celebrity Solstice cruise 4 years later! See the Solstice Review! So, instead we took the Skyride up (within walking distance of the ship) the mountain and enjoyed the view of the port (where we got incredible shots of the ship) and saw a free parrot show and had some refreshments. 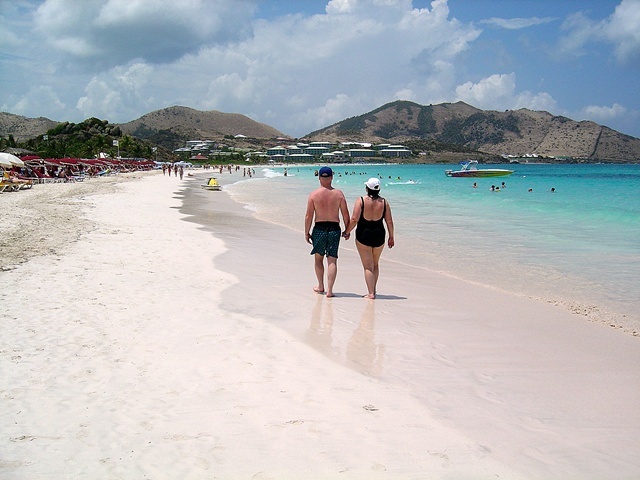 Normally we'd go to Magen's Bay, but we were a little over-roasted since Orient Bay (who knew SPF30 suntan lotion loses it's properties after a year???) so we decided to give the epidermis a break. 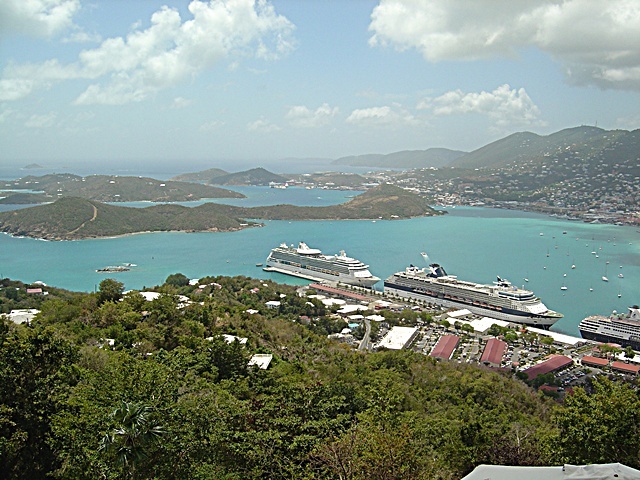 This is a view of Jewel of the Seas and the port from the top of the Skyride in St. Thomas! At Nassau, I went to Atlantis and Diane went shopping. I lost my shirt, but Patty and Mac bought me a new one that gets colors in the sun. It was a fun last day! 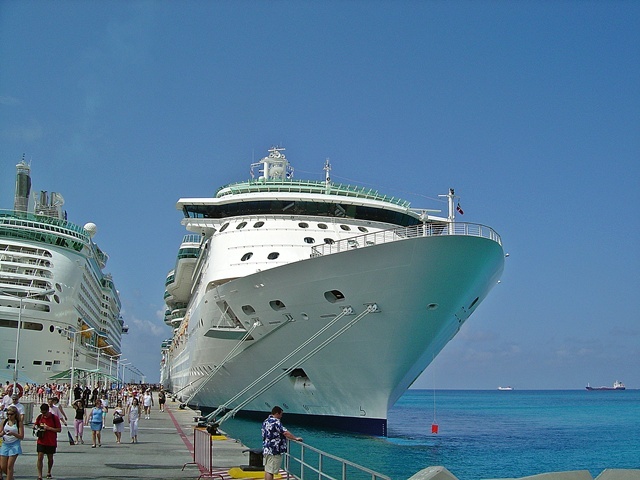 In between all these cool ports, we had two wonderful days at sea. I think that this crew was one of the friendliest yet... not once did someone walk by without a "Hello" or "Good Morning" and always with a smile. The ship also had the first female Cruise Director we've ever experienced, and this was a pleasant surprise. I like this bit of progressive thinking on RCI's part- good for them! Our cabin steward, Rex, was excellent. I had lots of dry cleaning and laundry for him and he always had this back in a timely manner. Our room was always immaculate and he was always quick to respond to any needs... no challenge was too great. I thought he'd be an excellent trainer for future cabin stewards and said this in the comment card. Artwork, unparalleled on any ship in my experience, festoons this entire ship... and it's breathtaking. (Although, I'll never understand the goofy flamingos at the top of the external elevator shaft.) 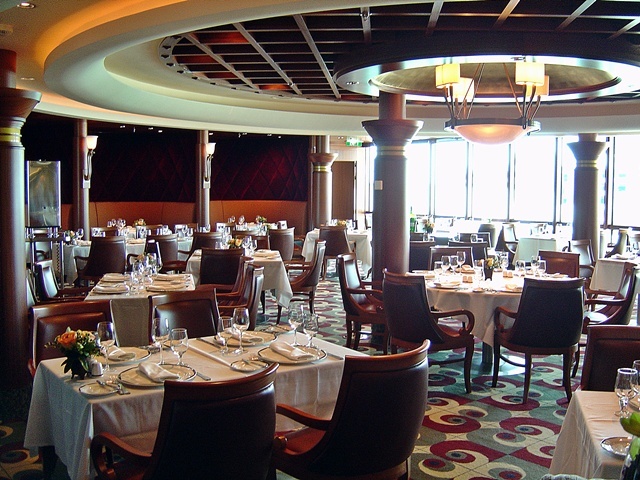 For one of the best views in the ship, go to the Crown and Anchor Society place and look down from the center glass floor! (It's hypnotic!) I was able to peek into the Concierge Club and I was suitably impressed... hey, I'm not that far from Diamond. I rate a sneak peek! I'm told the digs on the Voyager class are bigger but that the views aren't as nice as there are none with the Concierge Club being at the center of the ship. 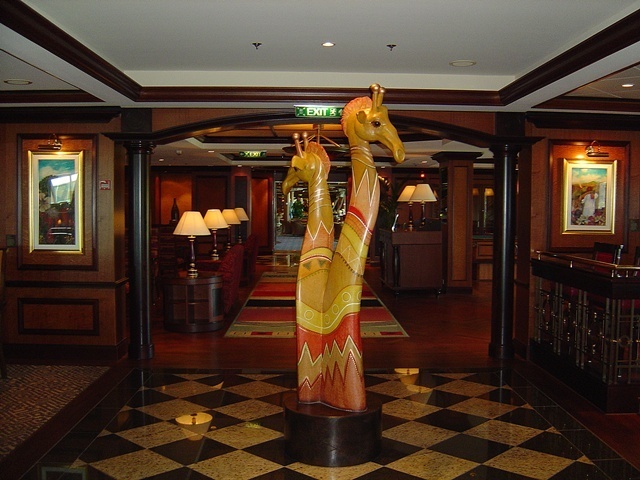 Update 2009: as of Sept 2009, Diamond members in the Crown and Anchor Society will no longer be able to use the Concierge Lounge. This is now reserved for Diamond Plus and Suite guests only. In wrapping up, I give this ship my highest recommendation. She's beautiful, warm, and friendly. I kept referring to her as "home" the entire week because I felt at home instantly. My mother, who sadly passed away suddenly last December and who was scheduled to make this cruise with us, would have loved this ship. She won a free cruise playing BINGO on Navigator (see the cruise review) and decided to take Patty as her guest. When she died, RCI graciously allowed Patty (her daughter and my sister) to take the cruise anyway and allowed her husband, Mac, to join her in Mom's place. Say what you will about RCI, but this is customer service above and beyond normal... and it's what keeps me coming back to them time and time again. 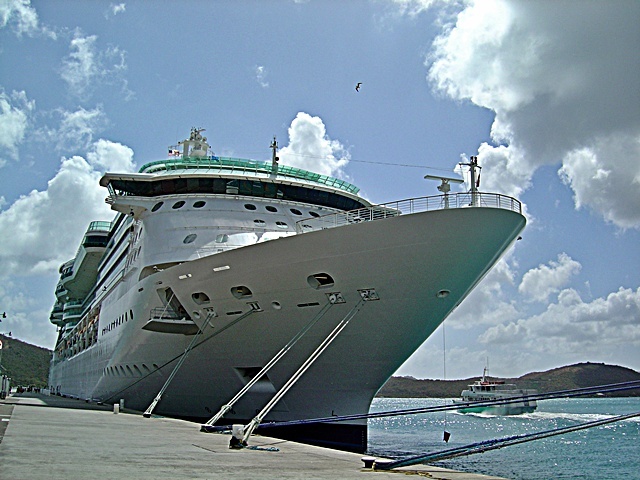 Jewel in St. Martin... to the left is her much larger sister, Adventure of the Seas! See more pictures from this cruise HERE!